Barbie as the Princess and the Pauper was produced in 2004. An old fashioned story with lots of great music and songs and lots of funny moments. The songs and lyrics are catchy and the role o barbie is a good for little ones. The animations is interesting. You will memorize all songs after watching this movie. Have fun. How to Watch Barbie in the Barbie as the Princess and the Pauper (2004) Barbie Film For Free No Download, No Surveys and 100% Free? 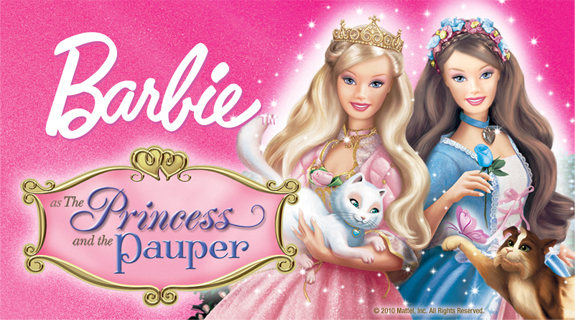 Click on the arrow button at the far bottom-right corner of the video player (stream) to play Barbie as the Princess and the Pauper full film at full-screen size. Please let me know via comments if the stream is working or not. 55 Responses to "Watch Barbie as the Princess and the Pauper (2004) Movie Online For Free in English Full Length"
barbie and the pink shoes!! please!!! Cleo, you are welcome. Thanks for your comment. Barbie in the Pink Shoes (2013) is already on my list of movies that will be added. THIS IS MY SECOND FAVORITE BARBIE MOVIE!!!!!!!!!!!!!!!!!!!!!!!!!!!!!! I WAS SOOO UPSET WHEN MY BROTHER DESTROYED IT BUT THANKS TO YOU I HAVE MY CHILDHOOD BACK!!!! YOUR SOOOOOO GREAT THANKS A BUNCH! XD T^T FOREVER I SHALL BE GREATFUL TOO YOU. Lmfao those bloopers at the end I never get tired of! thank you for uploading this movie !!! this was my first barbie movie i ever watched ! i just love love this movie !!!! thank you so much ! it is not coming. i waited for a long time but it is still not coming. hello ! First of all thank you for uploading all these Barbie material!! they are hard to find and your blog is a reliable source..but the film stopped at 64:37 minutes and seems impossible to continue..thanks in advance! It keeps stopping at just under 5 minutes! Please help! This is my favorite! Please fix this dear admin! this is just so so so so so so so so so so so so great this was my ever first movie out of all the movies ahhh i love thiss one!!!!!!!!!!!!!!!!!!!!!!!!!!!!!!!!!!!!!!!!!!!!!!!!!!!!!!!!!!!!!!!!!!!!!!!!!!!!!!!!!!!!!!!!!!!!!!!!!!!!!!!!!!!!!!!!!!!!!!!!!!!!!!!!!!!!!!!!!!!!!!!!!!!!!!!!!!!!!!!!!!!!!!!!!!!!!!!!!!!!!!!!!!!!!!!!!!!!!!!!!!!!!!!!!!!!!!!!!!!!!!!!!!!!!!!!!!!!!!!!!!!!!!!!!!!!!!!!!!!!!!!!!!!!!!!!!!!!!!!!!!!!!!!!!!!!!!!!!!!!!!!!!!!!!!!!!!!!!!!!!!!!!!!!!!!!!!!!!!!!!!!!! Great quality! Thanks for the upload! love this movie.. because im the one in that movie.. im .ERIKA !! And also in the Barbie Diamond Castle...Im LIANA..
MY gIVEN are in Barbie. MOVIES..
my name is LIANA ERIKA..
it stops in the middle. frustated! i had search for it for ages. and now this! I may be in high school but still the movie I watch to fall asleep to.. I love this movie I've been watching it since it came out... I make people watch this movie with me all the time and it's priceless when I look at there faces because I know every word. Who else noticed that this is almost exactly like barbie the princess and the popstar? I love the older barbie movies more than the new ones.